Real-time PCR is increasingly being adopted for RNA quantification and genetic analysis. At present the most popular real-time PCR assay is based on the hybridisation of a dual-labelled probe to the PCR product, and the development of a signal by loss of fluorescence quenching as PCR degrades the probe. Though this so-called 'TaqMan' approach has proved easy to optimise in practice, the dual-labelled probes are relatively expensive. We have designed a new assay based on SYBR-Green I binding that is quick, reliable, easily optimised and compares well with the published assay. Here we demonstrate its general applicability by measuring copy number in three different genetic contexts; the quantification of a gene rearrangement (T-cell receptor excision circles (TREC) in peripheral blood mononuclear cells); the detection and quantification of GLI, MYC-C and MYC-N gene amplification in cell lines and cancer biopsies; and detection of deletions in the OPA1 gene in dominant optic atrophy. Our assay has important clinical applications, providing accurate diagnostic results in less time, from less biopsy material and at less cost than assays currently employed such as FISH or Southern blotting. The detection and quantification of gene rearrangement, amplification, translocation or deletion is a significant problem, both in research and in a clinical diagnostic setting. Real-time PCR has become a well-established procedure for quantifying levels of gene expression [1–3]. Its power resides in the ability to detect, at every cycle of the PCR, the amount of PCR product (amplicon) using fluorescence. Several approaches have been employed to detect PCR products. The most popular, the 5'-nuclease assay, is based on the specific hybridisation of a dual-labelled TaqMan  probe to the PCR product. Another approach is based upon the binding of the fluorescent dye SYBR-Green I into the PCR product (PE Applied Biosystems, Warrington, UK). Although both assays are potentially rapid and sensitive, their principles of detection and optimisation are different, as is the resulting price per assay. Here we report the development and rigorous testing of a real-time PCR assay using the inexpensive SYBR-Green I technology. We developed our assay initially for the detection of a gene rearrangement in the T-cell receptor locus. The immune system requires a large diversity of immunoglobulins (Ig) and T-cell receptors (TCR) to screen the body for pathogens. Such diversity is achieved by rearranging pre-existing segments of the TCR or IG genes randomly . This process involves the excision of intervening segments of DNA, the ends of which are subsequently ligated to form T-cell reception excision small circles of episomal DNA (TRECs – Figure 1). The level of TRECs in peripheral blood mononuclear cells provides a surrogate measure of thymic activity and as such, there is a need for a rapid, cheap and reliable assay to quantify TRECs in clinical situations where the immune system may be compromised. Formation of TRECs. During their passage through the thymus, T-cell precursors rearrange their T-cell receptor (TCR) genes. This step requires the excision of segments of DNA, the ends of which are subsequently ligated to form small circles of episomal DNA (signal and coding), hereafter referred to as T-cell receptor excision circles (TRECs). 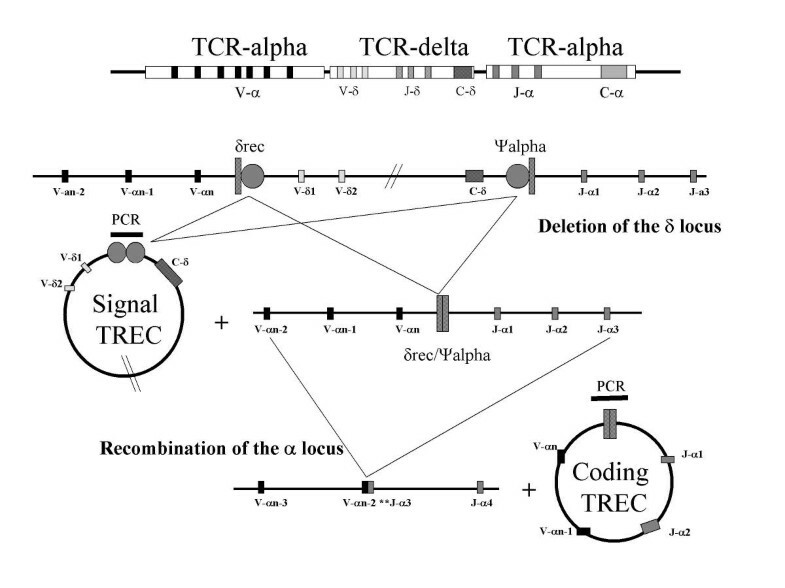 The sequences remaining after recombination provides the target for a PCR detection of TREC. Each mature T-cell exiting the thymus and released into the circulation, therefore contains episomal TRECs. As these cells replicate in the peripheral blood, TRECs are not replicated but are distributed among daughter cells and are gradually diluted in the peripheral T-cell pool. Therefore, by measuring the proportion of peripheral T-cells containing TRECs, an estimate of recent thymic function can be obtained. We have also gone on to demonstrate the more general applicability of our assay by using it to quantify other genetic events. Firstly we assayed gene amplification in cancer. The glioma-associated oncogene GLI was identified in 1987 and found amplified in double minutes in glioblastoma . It was mapped by in situ hybridisation to 12q13-14  a chromosomal region demonstrating amplification in subsets of glioblastomas and sarcomas [8, 9]. We used our assay to quantify GLI amplification in five tumor-derived cell lines. Similarly the MYC oncogene is amplified in a number of pathologies, particularly in neuroblastoma where MYC-N amplification is a diagnostic marker . We quantified MYC-C amplification in cell lines and MYC-N amplification in a set of tumour samples where it was associated with a diagnostic and prognosis of neuroblastoma . Lastly we assayed genomic copy number as a test for gene deletion in a dominant Mendelian disorder. Autosomal dominant optic atrophy (ADOA) is the most common hereditary optic neuropathy, resulting in progressive loss of visual fields, colour vision defects and in many cases registered blindness. The most common cause of ADOA is mutations in the OPA1 gene on chromosome 3q28-q29. Many different mutations have been described in families with ADOA, including point mutations, small deletions and insertions  and the deletion of either the entire gene  or of exon 20 alone . We applied our assay to the detection of a micro-deletion of the OPA1 gene in a family with ADOA where such a deletion had previously been identified. A real-time-PCR read-out is given as the number of PCR cycles ("cycle threshold" Ct) necessary to achieve a given level of fluorescence. For this study, the Ct was fixed in the exponential phase of the PCR (Figure 2A, linear part of the fluorescence curve). During the initial PCR cycles, the fluorescence signal emitted by SYBR-Green I bound to PCR product was usually too weak to register above background. Indeed, a difference could not be defined until after about 15 PCR cycles. During the exponential phase of the PCR the fluorescence doubled at each cycle. After 35 cycles, the intensity of fluorescent signal usually began to plateau, indicating that the PCR had reached a saturation status. As a Ct is proportional to the logarithm of initial amount of target in a sample, the relative concentration of one target with respect to another is reflected in the difference in cycle number (ΔCt) necessary to achieve the same level of fluorescence (Figure 2A). Real-time Optimisation. A). Real-time amplification plot. Three real-time amplification plots are shown for GAPDH as target 2, GLI as target 1 and no-template controls (background at the bottom of the graph). DNA from the SJSA1 cell line was used for this experiment. The cycle numbers (cycle threshold, Ct) necessary to achieve the given level of fluorescence of 2 (horizontal line), which lies in the log-linear phase of both PCR reactions, were 27.03 and 32.25 for target 1 and 2 respectively (vertical lines). A difference of 32.65-27.03 = 5.62 cycles between the two Ct, means that there was 25.62= 49.2 more of target 1 relative to target 2. This confirms an amplification of the GLI gene in this cell line. B) and C). Dissociation curves for GAPDH (B) and signal TREC (C) PCR reactions. Dissociation curves provide a graphical representation of the PCR product after the amplification process. A single peak in positive samples (graph +) suggests a single size product (GAPDH amplification from PBMC DNA). An absence of peak in the negative control sample (graph -) indicates the lack of primer dimer. Occasionally, primer-dimers were observed in negative control wells, (as shown by the arrow on plot C for signal TREC amplification from PBMC DNA). The melting temperature of each PCR product varies and is dependent on its sequence and size. A melting temperature of 81°C was observed for the GAPDH product (84 bp), which contained 17 Gs, 29 Cs, 17 As and 21 Ts. The signal TREC product (122 bp) had a melting temperature of 87°C and contained 19 Gs, 25 Cs, 33 As and 45 Ts. The occasional primer-dimers (indicated by the arrow on graph C) have a much lower melting temperature. D) Primer concentration optimization. Three sets of primers were designed to amplify 3 target genes (OPA1, MYC-C and GLI). A primer concentration optimization experiment was performed where all PCR conditions were the same apart from the primer concentration. The same PBMC DNA sample was used in all tests. Normalization was performed against GAPDH in this DNA sample using the delta Ct method. The primer concentration used for GAPDH in this assay was 100 nM. MYC-C (black bars) is optimally amplified at the concentrations of 500 nM for both primers with a ratio of 0.99. GLI (grey bars) is similarly detected over concentrations ranging from 100 to 500 nM for both primers however, with an optimal ratio of 0.98 at 300 nM. OPA1 (open bars) is only detected at a primer concentration of 500 nM with a ratio of 0.95. Of note, excess of primer is detrimental to all 3 PCR assay as amplifications yielded less product for the 3 different targets at concentrations of 1000 nM for each primer. Optimal design of the PCR primers is essential for accurate and specific quantification using real-time PCR. For the assay described herein, detection is based on the binding of the SYBR-Green I dye into double stranded PCR products, which is a sequence independent process. While this assay is cheaper than the more commonly used 5' nuclease assay, it loses the additional level of specificity introduced by the hybridisation of the PCR product to a specific fluorescent TaqMan probe. The sensitivity of detection with SYBR-Green I may therefore be compromised by the formation of primer-dimers, lack of specificity of the primers, primer concentration (which can be limiting) and the formation of secondary structures in the PCR product. All of these factors could lead to the creation of unexpected double-stranded DNA product, which would incorporate SYBR-Green I and register a fluorescent signal. The 5'-nuclease assay using TaqMan probes would also be compromised by primer dimers. Although they are not detected, they do alter the amplification efficiency of the specific product. The optimisation of the primer concentration is essential. Each set of primers work best under different concentration conditions. 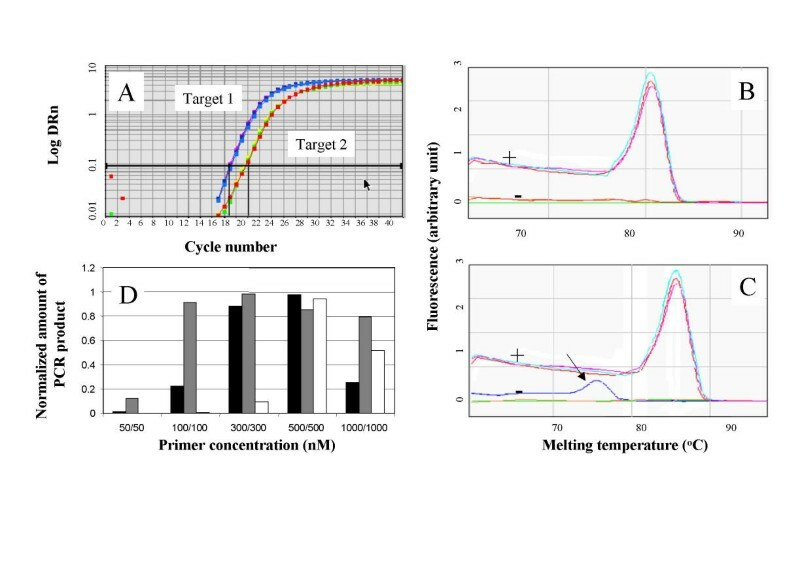 Primer design is also very restrictive: the annealing temperature is restricted to 58–60°C, which corresponds to the optimal working conditions for the AmpliTaq Gold DNA polymerase enzyme (Perkin Elmer), and the length of the PCR product is set between 80 and 150 bp. The use of software dedicated to RT-PCR primer design, such as Primer Express™ (Perkin Elmer), is highly recommended. For all experiments described in this report, each pair of primers was designed following the manufacturer's instructions to amplify products from the genes of interest ranging from 81 to 122 bp (Primer Express™, Perkin Elmer). Primer concentration is usually determined to be optimal when specific amplification relative to primer-dimers was maximal in a positive versus negative control experiment. However, the choice of the most appropriate conditions for our assay corresponds to the combination of primer concentration allowing a ratio of target gene to reference gene of 1 in a DNA sample with no genetic abnormality. This ratio is calculated using the ΔCt methods (ΔCt = Ct of the target – Ct of the reference). A delta Ct of 0 indicates a ratio of 1 between the target and the reference (2-(ΔCt) = 20 = 1). A number of factors can influence this assay, and the optimisation consists in compensating these factors to obtain a ratio of 1 in a DNA sample with no genetic abnormality. The inclusion of such a normal DNA sample on each experiment also provides a reference sample for a Δ-ΔCt method of calculation, however, as the normalisation will relate to a value close to 0 for the second ΔCt, both methods essentially give the same result. Complete absence of primer dimer was rarely achieved in a PCR negative control (Figure 2B and 2C), however, in an experimental negative including a template but no target, dimers were not observed. Furthermore, the inclusion of a heat dissociation experiment at the end of the PCR suggests that a single product is present (even if an electrophoresis is used once at the end of the first optimisation plate to confirm it). The degree of an eventual primer-dimer contribution (Figure 2C) to the overall fluorescent signal of the PCR negative control can also be detected in such a dissociation experiment. As an example, 3 sets of primers were used to amplify 3 targets (OPA1, GLI and MYC-C) in an optimisation assay where the only variable was the concentration of primers in the reaction (Figure 2D). For these examples, the concentration of primer for GAPDH was 100 nM for GLI and MYC-C and 50 nM for OPA1. However, for other target genes it was necessary to either increase or decrease the primer concentration for GAPDH (see Table 1). For this demonstration, we used normal PBMC derived DNA template and normalised the expression of these 3 target genes to GAPDH. The optimisation experiment consists in finding the conditions necessary to obtain a ratio of for target gene to reference. The first set of primers (black bars, MYC-C) showed a bell shaped optimisation pattern where the intermediate concentrations were optimum and giving ratio of target to reference close to 1. The second set of primers (grey bars, OPA1) showed a plateau type of curve where most of the higher concentrations were of similar efficiency. The last primer set (open bars, GLI) showed poor amplification at both extremes of the concentration range, and a single, efficient concentration of primer. In these optimisation experiments, primer dimers were not observed. Higher primer concentration had a limiting effect on the PCR reaction and would be detrimental to the accuracy of the quantification. GGA CTC ACC TGC GTC TGC TC. For an accurate quantification it is also necessary to verify that PCR efficiency is independent of the initial amount of target DNA. Each pair of primers was therefore tested across several logs dilution series of a positive control DNA sample. Figure 3A shows such an experiment for TREC quantification (coding and signal). It was necessary to use cloned template for this purpose, as a TREC rearrangement sequence is not available in genomic DNA. The two plots obtained for the signal and coding TREC (and the internal reference gene, GAPDH), were linear, demonstrating equal efficiency of the individual PCR assays over a large range of initial template concentrations. The titration plots were also super-imposed, demonstrating that the three PCR assays were equally efficient despite the differences in PCR product sizes and base pair constitution. Similar experiments were performed for all the other genes, using genomic DNA however (data not shown, and Table 1). DNA quantification using the SYBR-Green I assay. A). The sensitivity of the GAPDH , signal and coding TREC PCR assays are similar. Titration curves were obtained by taking cloned GAPDH, signal and coding TREC templates of known concentration and using these to create a seven log dilution series for each assay. The linearity of the plots shows the equal amplification of the assay over a range of input DNA concentrations. The superimposition of the plots proved that each assay was equally efficient despite the relative difference in product size (84, 98 and 122 bp), and allowed a comparison between genes. The coefficient of correlation for GAPDH (triangles) was R = -0.997); for signal TREC (squares) was R= -0.980 and for coding TREC (diamonds) was R= -0.995. B). GAPDH real-time readout is a reliable measure of the DNA concentration of a sample. Forty DNA samples were obtained independently from PBMCs, and their concentration was determined by measuring their OD at 260 nm (two readings were made for each sample at four different dilutions n = 8, reading at 280 nm were taken and ratio of OD 260/OD 280 were all > 1,8). A SYBR-Green I real-time quantification of GAPDH was then performed, giving a second independent estimate of DNA concentration. We observed a significant correlation (R= -0.842, P < 0.001) between the concentrations estimated by real-time Ct and by OD measurement in each sample. One of our major aims was to determine the limit of sensitivity of our assay in allowing accurate quantification of gene amplification, deletion or rearrangement from DNA extracted from relatively few cells. For this purpose we estimated the number of cells present in a given sample by real-time PCR quantification of the copy number of the housekeeping gene GAPDH, each cell having two allelic copies of this gene. In principle, any gene would be suitable, however, as we were expecting to look at deletions, amplifications and rearrangements, we chose a gene that was unlikely to be involved in any of these processes. We have assayed the linearity of the relationship between real-time Ct for GAPDH reading with cloned GAPDH target. The use of cloned template also provided a read-out that reflected the number of molecules present in the reaction, which could then be used for an absolute quantification (see Figure 4A). Therefore, Figure 3A also shows a standard curve correlating the GAPDH-Ct reading to the number of cloned GAPDH molecules, allowing us to correlate the GAPDH-Ct of a sample with a number of GAPDH molecules. This number, when divided by 2, would thereby correspond to the number of cells from which the DNA was initially extracted. We assayed the relationship between the amount of DNA in cell extracts and GAPDH readings. The relationship between GAPDH-Cts and the spectrophotometer-measured concentrations of forty genomic DNA samples extracted from PBMCs under the same conditions but at different times and by different research workers is linear as demonstrated in Figure 3B. 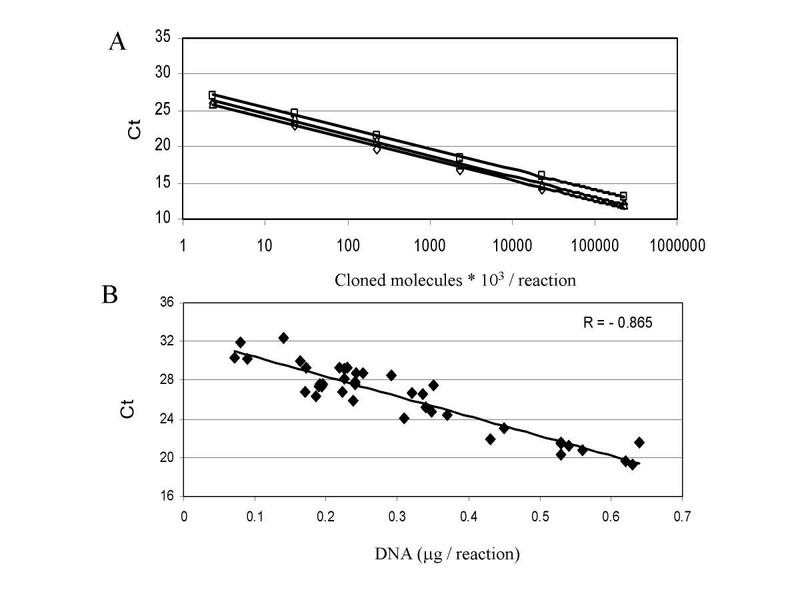 The relationship between the initial number of cells in a sample and the DNA concentration of the same sample was also linear (data not shown), indicating a similar efficiency of the DNA extraction method without regard for the initial number of cells in the samples. Together these results validate the use of GAPDH-Cts as an internal measure of the amount of DNA in each sample, reflecting the number of cells present in that sample. Absolute and relative quantifications of TREC determined using the SYBR-Green I assay are equivalent. We performed a quantification of TRECs by two methods. (A) Samples were quantified against a standard curve run in parallel with the samples, to obtain an absolute quantity of TRECs per μg of DNA. The results are described by the equation y = 96911exp(-0.0562x) where x represents age (years) and y TRECs per μg of DNA (extracted from CD4+T-cells) using an exponential regression model (B) A GAPDH and a TREC assay were run in parallel to normalize the number of TRECs to the number of CD4+T-cells in the sample. Linearity is described by the equation y = 69.013exp(-0.0432x) where x represents age (years) and y the proportion of cells containing a TREC. Both methods produced equivalent results as shown by the similarity in their equation parameters. C. The reproducibility of the second assay was tested using one sample, analyzed 17 times on consecutive PCR plates. There was 4.1% variability between the 17 measurements. The original PCR conditions described in the reports by Doueck and colleagues  were reproduced to clone two PCR products (380 bp each) for both signal and coding TRECs. Real-time PCR primers were designed flanking the site of the recombination, to amplify PCR products of 99 and 122 bp, specific for signal and coding TRECs respectively (see Figure 1). Optimisation and standardisation were performed (see Figure 2 and 3). Two quantification methods were used to compare a set of DNA samples extracted from CD4+T-cells in ten healthy individuals. The first method determined the number of TREC molecules per μg of DNA, relying on DNA concentration obtained by optical density readings. Our results were in line with published values [14, 15] for a similar age group (Figure 4A). The second method estimated the number of cells in the reaction by quantifying GAPDH copy number as described above, giving the number of cells containing a TREC as a percentage of total cells (Figure 4A). Results obtained with these methods were comparable and could be super-imposed. The second method has the advantage of providing a more understandable scale. This method was validated on a sorted cell population of less than fifty cells (data not shown), demonstrating that it could be adapted to samples with a very small yield of DNA . The reproducibility of the PCR assay was determined by including a standardisation sample in 17 consecutive PCR plates, run by 2 independent manipulators (Figure 4C). In this particular sample, the mean TREC content was 9.08 %, with a standard deviation of 0.611 %. We next assessed the general applicability of our experimental procedure to determine levels of relative gene amplification. We used our assay to quantify GLI copy number in genomic DNA extracted from cell lines known to exhibit GLI gene amplification at various levels . We proceeded through optimisation as in Figure 2. Analysis using our assay indicated slightly higher levels of amplification (black bars) than previously reported (open bars)  (Figure 5A). Similar results were observed when multiplex-fluorescent PCR was used to analyse GLI copy number in the DNA extracted from these cell lines (grey bars). We also looked for evidence of MYC-C gene amplification in two cell lines HT29 and colo320  and in normal PBMCs using our assay. 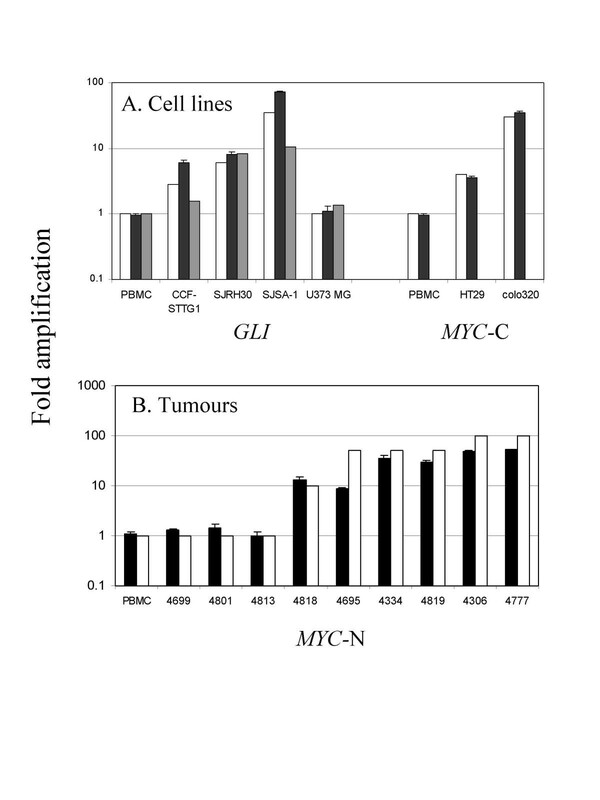 After performing optimisation, results (black bars) were similar to published amplification levels (open bars) for both cell lines but were normal in healthy PBMCs (Figure 5A). Quantification of gene amplification by a SYBR-Green I assay. A) Gene amplification detected in cell lines. 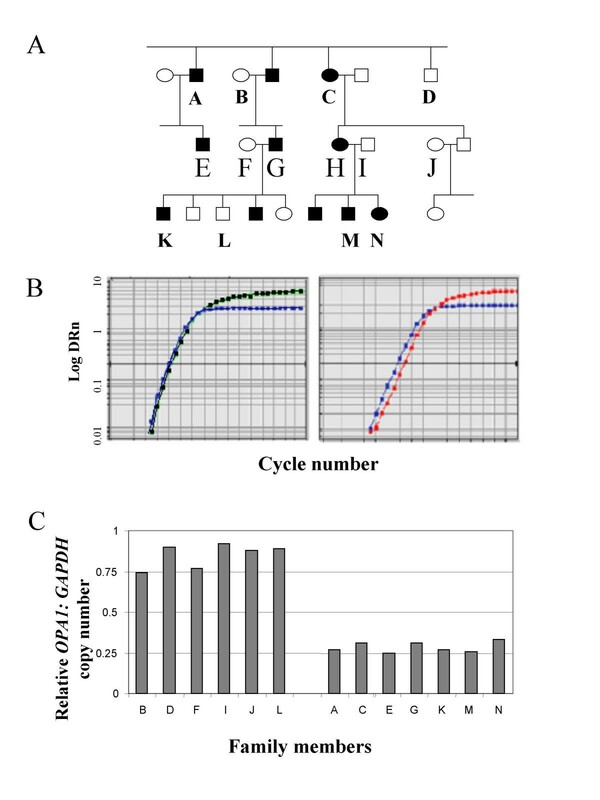 Cell lines with known levels of gene amplification (open bars) were tested for GLI  or MYC-C  gene amplification using real-time PCR and/or QM-Multiplex PCR. Results obtained using the SYBR-Green I real-time assay (black bars, triplicates) correlated well with the levels of amplification for both genes described previously in these cell-lines. However, QM-Multiplex PCR gave lower levels of amplification in two out of five samples compared to reported results. B) Detection of gene amplification in DNA extracted from neuroblastoma tumor samples. Tumor samples with known levels of MYC-N gene amplification, established using standard FISH techniques (open bars, estimated 1, 10, 50 or 100 amplification fold were tested for MYC-N gene amplification using our real-time PCR assay (black bars, triplicate). Results obtained correlated well with reported levels and confirmed either the presence of an MYC-N gene amplification in 6 out of 9 tumors or its absence in 3 tumors. We also applied the SYBR-Green I assay to tumour samples for the detection of the MYC-N gene amplification. These samples had been tested previously by standard procedures for the diagnosis of neuroblastoma using fluorescence in-situ hybridisation (FISH) . Our results (Figure 5B, black bars) compared well with the established amplification factor recorded for these tumours (open bars) and confirmed the presence of MYC-N amplification in 6 tumours. Using the Δ-ΔCt methods of calculation with one of the sample becoming the reference (either sample 4777, 100 fold amplification or sample 4334, 50 fold amplification) does not change the results significantly. Point mutations and small insertions or deletions in the OPA1 gene have been shown to underlie more than half of all cases of dominant optic atrophy. In addition two larger deletions in OPA1 have been detected, each in a single family. One of these deletes exon 20 and the surrounding intronic DNA , while the other deletes the entire gene and over half a megabase of surrounding DNA . Traditional PCR-based mutation detection methods such as single strand contamination polymorphism (SSCP) analysis would miss these mutations since only the normal allele would amplify. We therefore designed a SYBR-Green I assay to quantify the number of copies of OPA1 exon 20 present in any given sample, which should therefore detect both of these deletions. We tested this on genomic DNA from patients and healthy members of the family (Figure 6A) with the deletion of the entire gene, and were able to confirm a reduction in relative copy number in these samples as compared to healthy members of the family (figure 6B and 6C). In this particular assay, exon 20 of the OPA1 gene is the target sequence. It is 165 bp long and limited the design of exon specific primers. The ratio of target gene to reference obtained in normal PBMCs during optimisation was 0.96 (Figure 2C and Table 1). However, the ΔCts in affected individual was on average more than 1 cycle compared to unaffected individuals indicating a reduction of at least 50%. We also applied this assay to the quantification of gene copy number in a transgenic mouse model. The gene Hop was 5' FLAG-tagged. Endogenous Hop sequences were also used as reference gene for the quantification. We identified founders carrying either 1 or 2 copies of the transgene (data not shown). Quantification of gene deletion by a SYBR-Green I assay. A. Pedigree of an ADOA family with a deletion of the entire OPA1 gene. Carriers of the deletion are indicated with filled symbols and normal individuals with open symbols . B. Real-time plot obtained for the quantification of the OPA1 gene deletion. Genomic DNA from 2 individuals (a carrier and a normal) was assayed for copy number of the OPA1 gene using the SYBR-Green I real-time PCR assay. Real-time OPA1 amplification plots for carriers (right panel) are consistently at least one cycle behind the plots obtained with GAPDH, while plots for GAPDH and OPA1 in non-carriers are almost superimposed (left panel). C. Quantification of the OPA1 gene deletion in 13 members of the family. DNA was extracted from family members indicated by letters on A. The OPA1 versus GAPDH PCR assay was performed. Non-carriers showed a ratio close to 1 for the GAPDH versus OPA1 quantification. In contrast, all carriers of the deletion showed a clear reduction in this ratio. There are major advantages of using real-time PCR compared to conventional semi-quantitative PCR. Firstly, the progression of the PCR reaction may be monitored after each cycle rather than at the end, thereby providing a much better quantification assay; secondly, very little DNA is needed; thirdly it is a non-radioactive assay; and finally it can be performed in approximately two hours. The advantages of using SYBR-Green I quantification over a 5'-nuclease assay with TaqMan probes are the relative simplicity and the reduced cost of SYBR-Green I compared to TaqMan probes. The assay we have designed provides an accurate relative quantification of gene rearrangement, gene deletion and gene amplification. The principle used in this assay can be adapted to a large number of biological systems and could therefore have a significant impact on patient care by providing accurate results in a shorter time. Another major advantage of our assay is that it can be carried out with only a few biopsy cells. Archived material such as paraffin embedded tissue sections can be used. DNA can be extracted from such material using the same methodology (with no need for de-waxing) and used in a SYBR-Green I real-time assay (data not shown). Therefore our assay has significant advantages over other methods. A real-time 5'-nuclease assay using TaqMan probes has recently been described for the detection of TRECs . However, this relies on an absolute quantification of TRECs by normalisation to a standard curve using cloned template. In our hands, a number of practical problems were encountered with this approach. These included the potential risk of cross-contamination of equipment with the cloned template, the cost of repeating the standardisation but most importantly difficulties with quantification of DNA in small samples. This latter problem is particularly pertinent for following thymic function in biological samples in which T-cells are depleted. Our strategy allowed us to quantify TRECs in samples of less than one hundred cells. The lowest number of cells from which we were able to extract DNA and satisfactorily quantify TREC was 70 cells (data not shown) . TREC measurements provide information about immune reconstitution in a number of clinical situations, including anti-HIV-therapy, chemotherapy and bone marrow or stem cell transplantation in cancer patients, and in autoimmune disease patients [14, 16, 21, 22]. 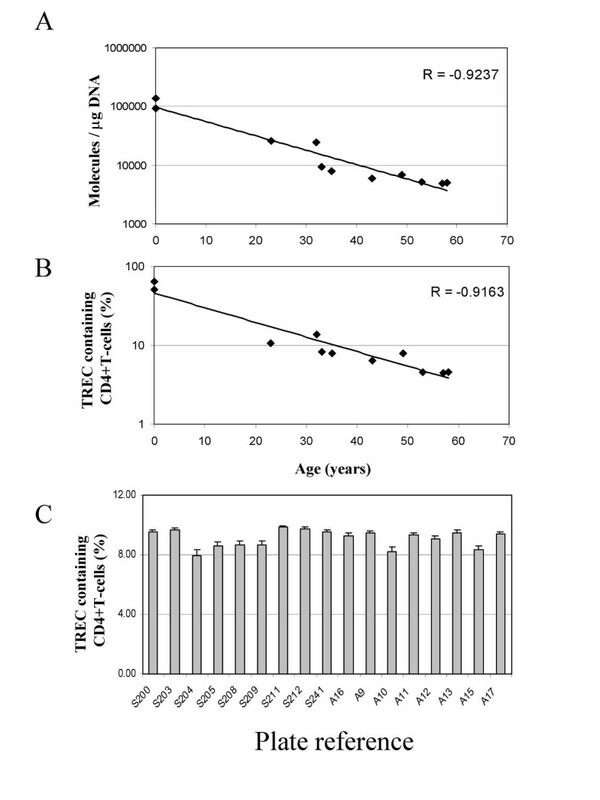 Despite recent reports describing the lack of a relationship between recent thymic activity and TREC measurement in non-T-cell depleted host, with controlled homeostasis [16, 23], TREC are still the best means of assessing thymic output in situation where there are a limited number of T-cells to start with, such as following lymphodepletion achieved through therapeutical means [chemotherapy, ] or caused by disease activity (graft-versus-host disease  or viruses (HIV ). Other gene rearrangements or translocations have been studied using real-time PCR. For example, the major and minor break-points of the chromosome 14 to 18 translocation t(14:18)(q32;q21) have been analysed in non-Hodgkins lymphomas using a 5'-nuclease assay with TaqMan probes  and results compared well with conventional PCR (99 % concordance ). This TaqMan type of assay could easily be replaced by a SYBR-Green I assay as this simply reflects a change in the means of detection of the PCR product. Compared to Southern blotting or FISH when used for the detection of gene amplification, our SYBR-Green I real-time PCR assay provides a rapid and accurate alternative. Furthermore, a FISH-based assay would require live material, which may not be available or easy to obtain, whereas the assay described here could be applied to tumour derived DNA, which is much more readily available. The use of the SYBR-Green I assay for the detection of gene amplification could have an important impact for patients as results are produced rapidly (in less than one day) with a minimal amount of biopsy material. The diagnosis and treatment of a number of severe conditions could benefit from the development of an assay based on our findings. For example, the multi-drug resistance phenotype in tumours results from the amplification of the MDR gene, which could be assayed quickly and cheaply as described above . Similarly, an assay could be developed to identify cyclin D1 and MDM2 gene amplification. The former is a prognostic marker in breast carcinoma  while the latter plays a role in the pathogenesis of a variety of tumours . Lastly we successfully detected the deletion of one allelic copy of the OPA1 gene in an ADOA family. To date such genetic abnormalities can only be detected unequivocally by FISH. This requires live material and is therefore not always possible. This assay could be applied to any gene implicated in an autosomal dominant disease, in order to determine whether whole or partial gene deletion is a significant cause of disease. This SYBR green I assay could also be applied to a number of conditions where a tumour suppressor gene is involved in inherited susceptibility to cancer (p53, Rb, WT1, APC, VHL or BRCA1). In these conditions, one copy of the tumour suppressor gene is either mutated or deleted in the germ line, while the second copy is lost or mutated in the tumour itself. Genetic counselling could therefore benefit from a quick and reliable assay to determine carriers of such deletions. PBMCs were recovered using a step gradient sucrose separation procedure (Lymphoprep, Ficomed, Oslo, Norway) from 5.0 ml of heparinized blood. DNA was extracted using a standard proteinase K (Roche, Mannhein, Germany) digestion (over night at 55°C) followed by phenol/choloroform extraction (ready red, Appligen-Oncor, Ilkirch France) and DNA precipitation using ethanol. DNA was recovered by centrifugation, dissolved in TE (TRIS 10 mM, EDTA 1 mM, pH8), and stored at -20°C. For the TREC assay, a further CD4+ T-cell separation was performed using magnetic depletion (CD4+ T-cell negative selection kit, Metachem, Meylan, France). Real-time PCR was performed using an ABI 7700 Sequence Detection System (PE Applied-Biosystems) in the presence of SYBR-green. The optimisation of the real-time PCR reaction was performed according to the manufacturer's instructions (PE Applied-Biosystems, User Bulletin 2 applied to the SYBR-Green I core reagent protocol) but scaled down to 25 μl per reaction. The PCR conditions were standard (SYBR-Green I core reagent protocol) and all reagents were provided in the SYBR-Green I core reagent kit, including AmpliTaq-GOLD polymerase (PE Applied-Biosystems). After optimisation (see Results section), nucleotide primers were used at various concentrations for the detection and quantification of GAPDH, signal and coding TREC, GLI, MYC-C, MYC-N, OPA1, FLAG and Hop. Gene dosage of GLI was analysed by Fluorescent Differential PCR employing FAM labelled oligonucleotide primers . Two reference loci were also used: exon 19 of the cystic fibrosis transmembrane conductance regulator (CFTR) at 7q31 and ubiquitin-conjugating enzyme pseudogene (UBE2L2) at 12q12. PCR amplification was carried out in 30 μl 10 mM Tris-HCl buffer, pH 9.0, containing 50 mM KCl, 0.1% (v/v) Triton X-100, 1.5 mM MgCl2, 0.2 mM dNTPs, 5 μM of each primer for UBE2L2 and CFTR, 100 ng of genomic DNA, 7.5 μM of the GLI primers and 2 units Taq DNA polymerase. PCR conditions consisted of an initial denaturation step of 95°C for 5 minutes, followed by 24 cycles of 95°C for 1 minute, 58°C for 1 minute and 72°C for 1 minute, with a final extension of 72°C for 10 minutes. A PCR using human genomic DNA as a control was routinely run in parallel. Moreover, experiments were performed in triplicate to ensure reproducibility of the technique. The FAM labelled products were separated through a denaturing polyacrylamide gel on an ABI 377 fragment analyser (PE Applied Biosystems). Quantitative analysis of the PCR products was performed using Genescan 672 software© (PE Applied Biosystems). GLI gene dosage was calculated by comparing the ratios of GLI to reference gene peak areas generated by control DNA with those generated by the cell line DNAs, as described . Primer sequences were as follows: GLI-F-d TGA TGC AGT TCC TTT ATT ATC AGG; GLI-R-(FAM)-d AGA GTA GGG AAT CTC ATC CAT CA, giving a product of 200 bp. UB-F(FAM)-d CGA AGA GCA CAC TTA AAG ATC TG; Ub-R-d GGT CAG CCT-GAA GTG GAT GCT CA generating a 173 bp product. CFTR19-F-dCCT ACC AAG TCA ACC AAA CC; CFTR19-R(FAM)-dACA TTG CTT CAG GCT ACT GG; generating a product of 268 bp. FP, conceived the study, designed it, performed it and supervised the real time PCR work of other authors. CT, performed the deletion work. KB, performed the Fluorescent Differential PCR work. FTL, performed the transgenic mouse work. SHD, provided technical assistance to FP. PAR, supervised the Fluorescent Differential PCR work. CFI, supervised the deletion work. JDI, is head of group. AFM, is head of department.